Lithospermum caroliniense (Walt. ) MacMill. Also Called: Puccoon, carolina gromwell. Stems: Erect, 1 to several, simple or branched above, rough-hairy. Leaves: Alternate, simple, sessile, crowded, linear to lanceolate, 1 to 2.5 inches long, to 1/2 inch wide, rough-hairy, tiny bump at base of each hair; margins entire; tips somewhat pointed; basal leaves often absent at flowering. Flowers: Calyces 5-lobed, stiff-hairy, much shorter than corollas; corollas showy, funnel- to trumpet-shaped, tube 1/2 to 3/4 inch long, top limb 1/2 to 1 inch wide, 5-lobed; stamens 5. Fruits: Nutlets, 4, egg-shaped, hard, smooth, shiny, white, each containing 1 seed. Habitat: Open, sandy prairies and open woods. 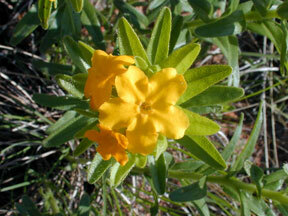 Uses: Native Americans used the roots of puccoon to treat chest wounds and to produce red face paint and a red dye. Comments: Puccoon is difficult to transplant. See also hoary puccoon and fringed puccoon .